January 12, 2016, 4:04 PM · A song without words for the violin -- that is what Russian-American violinist Yevgeny Kutik wanted to create when he commissioned composer Timo Andres to write him a piece for violin and piano. 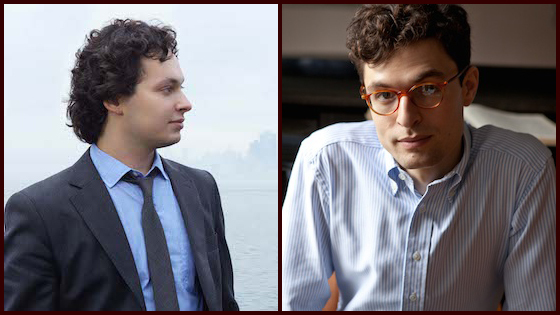 The result is "Words Fail," a work that Kutik and Andres (also a pianist) will premiere on Sunday in Washington, D.C. at the Phillips Collection during a concert that will also feature works by Nico Muhly and Stravinsky. Laurie: How did you meet pianist/composer Timo Andres, and have you worked together before? What led you to commission him specifically? Yevgeny: Our paths initially crossed at the Tanglewood Music Center, where we were both fellows at the same time. I first heard his music there and was immediately intrigued by his sound and artistic voice. Since that time, I've purchased both of his solo CDs, which are brilliant, and have been happily following his successful career. Timo also attended several of my recent concerts in the New York City area. When I decided to commission some new composers, his name immediately came to mind. A very good mutual friend "re-introduced" us, and I then approached him about this project. Laurie: You said you became fascinated by the idea of something that makes a person “speechless” — did you have a specific incident that led you to think about this, and if so, what was it? Yevgeny: I started thinking about this after hearing a recording of several songs from Mendelssohn's collection of Songs Without Words. Mendelssohn rebuffed efforts to put words to the songs because they were meant specifically to express emotions that were beyond the capability of words. This got me thinking about certain moments, when either because of something I saw or read, or what someone told me, I would be unable to speak--a very specific feeling I wanted to explore further. Laurie: How did this process work? Did he write the entire piece, then show you? Or were you there for various stages? How much say did you have in the violin part? Any points of disagreement? Did you work together in person, or through something like Skype? Yevgeny: We had an initial meeting to discuss the idea, shape, form, and concept of "Words Fail." Several months later, I received a first draft of the score from Timo in my email inbox. It was very exciting! I went through the work slowly and came up with a number of questions, mainly to do with technical execution, and we discussed this via email. Several weeks after the first draft, we met and read through the work, and then worked through it in careful detail. There were numerous small changes here and there, but, for the most part, the first draft really held together--he did a wonderful job. Laurie: Did you actually commission the work, or did someone else? How did that happen, did you have to raise money with a Kickstarter, etc.? Yevgeny: Initially, I had no idea how to pay for the work, but decided to go ahead anyway, knowing I could personally pay for a "down-payment" on the work if need be. Once I knew Timo had agreed to take on the project, I came up with a list of individuals and foundations that have supported me in the past, and then narrowed this down to individuals who have a particular affinity for new music/composers. I further narrowed down that list to people who knew Timo's work and my work. This resulted in a very small, but specific list of individuals and foundations, and at that point I pitched the idea to each of them. It took time and it wasn't easy, but I found a group of supporters for the piece that have a lot in common and are very excited about this new work. Laurie: Have you ever had a piece written for you before, or is this the first time? How do you feel about that? Is there anything in the work that he said was directed at your personality or your playing? Yevgeny: I have premiered a number of works, several of which were written specifically written for me, while for the rest I just had the opportunity to be the first performer. However, this was the first major work that I was involved in from the very first stage through the world premiere. It feels quite awesome and rewarding to have come up with a concept, picked the composer, raised the funds, worked through the piece and, then, have the joy – and responsibility! - to present it publicly. I think Timo wrote a very compelling piece. I don't know whether my playing influenced him, but I certainly feel that many parts of the piece seem to be a natural fit with my way of playing. Laurie: What is the style of this piece, is it abstract, or fairly tonal, etc.? Yevgeny: Words Fail has hints of tonality and dissonance, and overall tends towards the minimalistic. At times it seems to be almost late-romantic Schoenberg. I don't know how Timo would like it described, so I hope I don't get in trouble! Laurie: Anything else to add? Yevgeny: I hope to have the opportunity to perform "Words Fail" many times in the future and hopefully that other violinists add it to their repertoire as well. As for 2016, in addition to performances of standard (but great!) concerti with orchestras across the country, I am gearing up for a new commission from Michael Gandolfi and plan to start work on my third album for Marquis Classics later this year! Yevgeny Kutik will give the world premiere of Words Fail by Timo Andres in a concert series curated by Nico Muhly on January 17, 2016 at The Phillips Collection in Washington, D.C. Click here for more information.